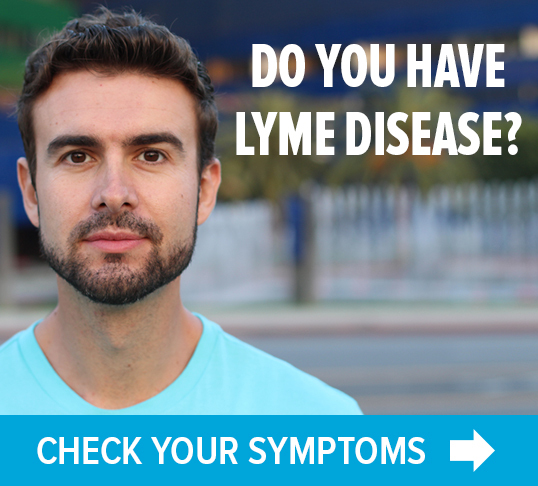 The most common Lyme disease tests are indirect ones. They measure the patient’s antibody response to the infection, not the infection itself. The two most-used antibody tests are the enzyme-linked immunosorbent assay (ELISA) and the Western blot. 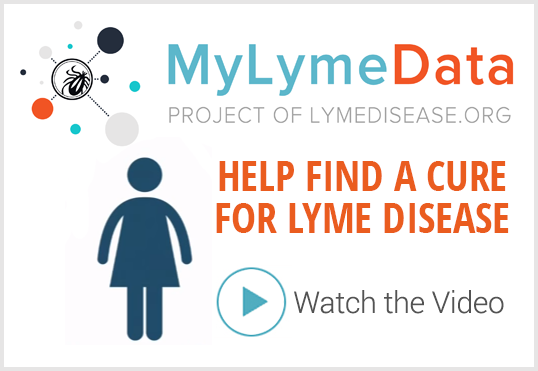 The CDC recommends that doctors first order an ELISA to screen for Lyme disease and then confirm Lyme disease with a Western blot. During the first four-to-six weeks of Lyme infection, these Lyme disease tests are unreliable because most people have not yet developed the antibody response that the test measures. Even later in the illness, the two-tiered testing is highly insensitive missing roughly half of those who have Lyme disease. 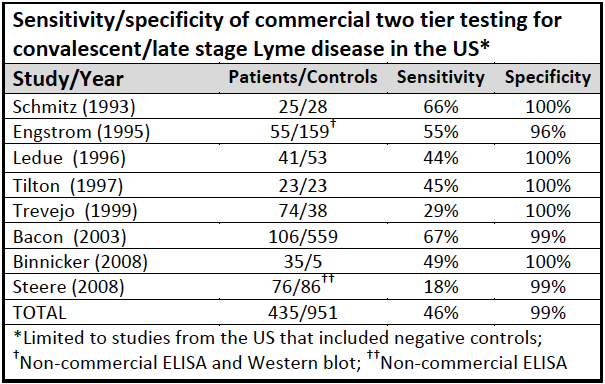 Two-tiered Lyme disease testing uses two tests. The first is a screening test that should detect anyone who might have the disease. Tests that do this well have are regarded as having high sensitivity. This test is followed by a second test that is intended to make sure that only people with the disease are diagnosed. Tests that do this well have high specificity. 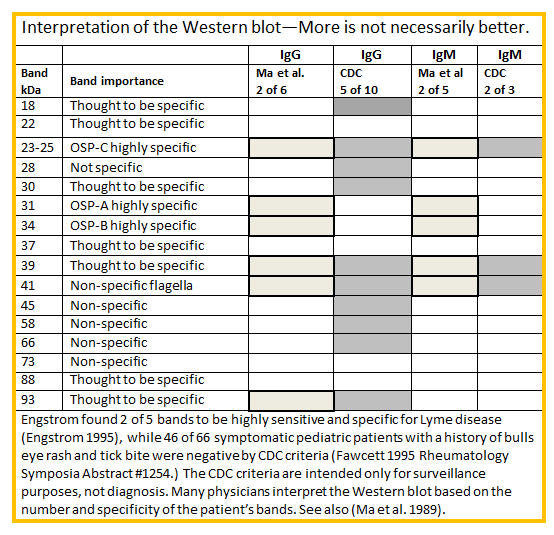 For a comprehensive explanation of the western blot test, download Understanding Western Blot Lyme disease test. 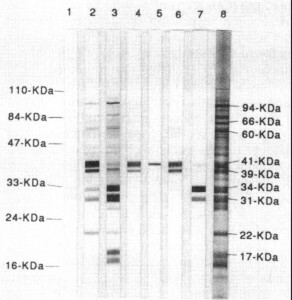 The chart below will help you understand how to interpret the western blot test. The IgM and IgG ImmunoBlot (IB) are qualitative immunoassays in which antibodies are visualized. They are used to determine whether pathogen-specific antibodies are present in patient serum or plasma. These tests are generally more sensitive and specific than the Western Blot, ELISA and IFA tests. 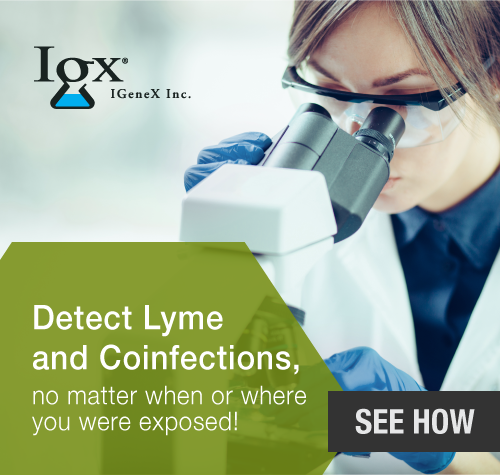 Learn more about these Lyme disease tests that IGENEX offers. 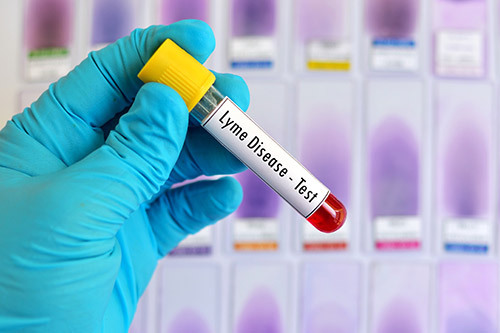 Although the CDC recommends that patients use “FDA-approved” tests, LDo does not support this restriction because there are no FDA-approved test for Lyme disease. Instead, the the FDA has “cleared” certain lab tests, but these test are not required to demonstrate that they are effective or safe, they are only required to be “equivalent” to test previously cleared. The current FDA cleared tests have poor sensitivity and miss more than 50% of patients with Lyme disease. The US Centers for Medicare & Medicaid Services (CMS) requires tests without FDA approval to undergo a rigorous certification process. CMS regulates all laboratory testing (except research) performed on humans in the U.S. through the Clinical Laboratory Improvement Amendments (CLIA). CLIA certification is designed to ensure quality laboratory testing. All clinical laboratories must be properly certified to receive Medicare or Medicaid payments. CLIA covers approximately 244,000 laboratory entities. Two highly specific bands (OspA and OspB) are not included in the CDC bands because they were used for vaccine development. Your doctor may want to know if you have antibodies directed towards those proteins. A few labs test for them.